Just scraping in near the end of the month, my second wear of this Asos skater dress that I bought in July. 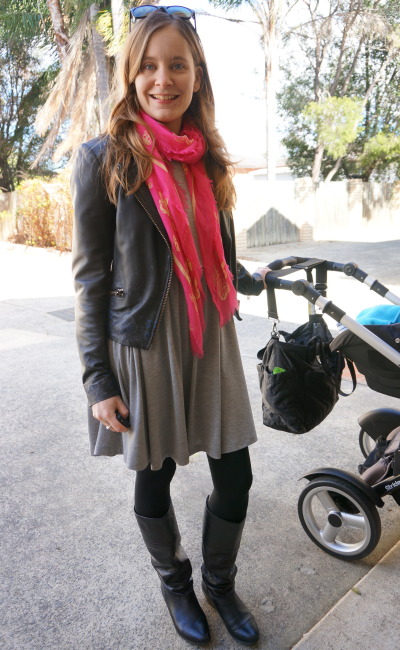 Wore it out for a morning of shopping with baby T to stock up on more baby-related things. Thought that the bright pink scarf was a nice bit of colour against all the black and grey. It's a great, neutral, basic dress, that was on sale and in a flattering silhouette (skater style dresses are good for post-baby bodies!) so it should have been a winner. I find myself wanting to pass by this dress in my wardrobe though, and had to keep trying to remember to wear it. I love grey clothes and I love dresses...thinking about why I didn't want to wear this, I've realised that I have very few neutral, basic dresses in my wardrobe. I tend to buy and wear more printed dresses, the neutral ones just seem too basic and don't get worn a lot. Something I'm going to try to change with the addition of this grey dress to my wardrobe, but also a preference I've never really noticed before I set myself the task of evaluating what I buy. Will be interesting to see how long it takes me to wear this dress again, and if I keep passing it by for more 'exciting' dresses. An eye-opening purchase, but I can't be sure I'll actually wear it often. Last worn: sunglasses, printed leather jacket, pink and yellow skull scarf, grey skater dress, leather boots, Marc by Marc Jacobs baby bag. In complete contrast to the grey dress, this striped tee dress that I bought in July I completely adore and I've had to stop myself from wearing it too often so I could meet my goal of wearing all my purchases twice this month! Thought the stripes would pair really nicely with the paisley print of the snood. Felt comfortable and happy in this outfit all day. Baby T, Cooper and I went to a little picnic in the park with some other mummies for a meet and greet. It was so fun being surrounded by so many cute (and talented!) babies and wonderful to have some adult conversation and compare notes on pregnancy, birth, feeding, sleeping and milestones. Was glad I'd worn my thicker legging-like tights, as although baby T can't wander far, Cooper had me moving around quite frequently and I did have to tug my dress back down once or twice! 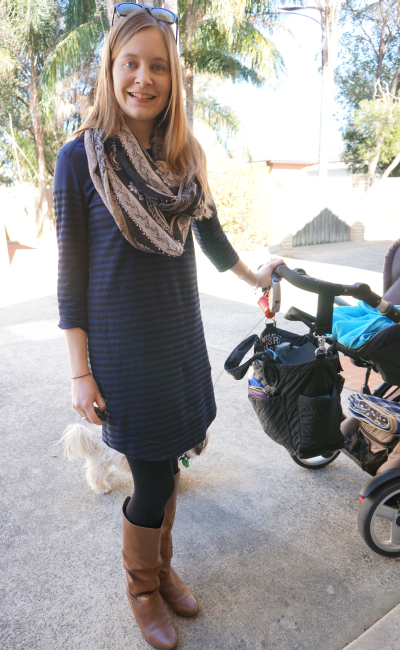 Last worn: Wayfarers (see above), paisley print snood, striped tee dress, leather boots, Marc by Marc Jacobs baby bag(see above). Linking up with Wardrobe Wednesday, WIWW, What I Wore, Style Me Wednesday, Fashion Informant, Spotlight Weekly today. For me, a dress needs to at least have one particular detail to consider buying it. Love the paisley snood in the second picture, it looks so chic. Aww, love your outfit. You scarf is amazing! Absolutely love the first outfit, the pop of pink is just magic on you! Looking gorgeous as always, really love that colorful scarf and your jacket! I adore both of those outfits and all the clothing you mentioned on the title of this post are perfect pieces I would also layer for and wear a lot come Winter. I actually have similar dresses to yours so I will be pinning the Outfits. Love the bright pink scarf as a pop of color among the gray and black! You look GREAT!! You are making me so ready for cooler temps here! Love both of these dresses. It's so nice to have versatile pieces like this in your wardrobe. Leather boots are great for winter! I am looking for a pair as well. You're dressing fabulously again! Love both looks Mica! Perfect mummy outfit; looking very stylish! Nice layering! I can't wait to layer up for fall! I really like both outfits. And adult interaction is so nice and meeting other babies too! Love your outfits! I totally agree with saving money and buying things that you'll use often. Since moving away from home, I had to keep my money on check and balance accordingly. So far, I've been pretty good (although I like to splurge now and then). Buying clothes that I can wear more than once and very often is my priority right now! That's a good way to see clothing purchases! Although I manage to dent my budget by saving money on clothes and splurging on accessories, haha! You can definitely rock a dress hot mama! I love both looks! You look so cute in dresses with leggings and boots! The scarfs are both awesome as well. Both of these dresses look fab on you..I tend to do the same about passing up on a particular outfit..only to wear it later and love it..I have been through same situations and learned important lessons not to hastily purchase things. you look so fantastic in both outfits! layering up dresses is one of my favorite things. you've convinced me that i need a striped shift dress for fall/winter. Skater dresses look amazing on you Mica!!! I love both. You've given me some great ideas with these! I love leather :). You look so stylish! I can definitely learn more with friends like you helping me Renae! :) It was a great tip! I love the outfit you wore on your shopping date with the baby! You're completely right about the bright pink scarf bringing some colour to the outfit! I'm the same as you, I always pass by the neutral clothing in my wardrobe and in fact don't own that much myself. I get so upset that winter is always filled with those tones as well! Who says you can't wear bright colours in winter right??? But i guess this problem is solved with the addition of bright accessories! Love the scarves, nice looks! Love the beautiful pink scarf. I've never worn a skater dress or skirt, it looks so comfy. It is very comfy! A little breezy when the wind catches it though, haha!